First up is a classic tribal print. I love kicking off the season with less-traditional versions of Christmas colours. It's a nice way to ease into it, plus mint is always a fan favourite. I think this is the first non-accent nail manicure I've done in a very long time (accent nails = no time/laziness). I incorporated my usual tribal designs as well as more Christmas-themed patterns. I started with American Apparel T-Shirt on all of my nails. I used the brushes from American Apparel Office and American Apparel Poppy to make thick vertical stripes of colour. Then I used a white striping polish and dotting tools for the details. 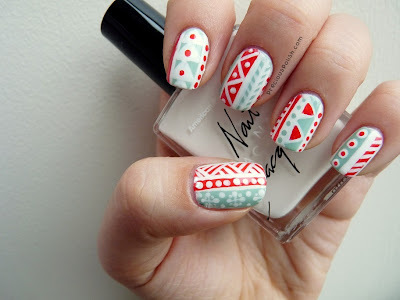 /Have you started your holiday/winter nail art yet? Feel free to send me links below or tweet photos to me @preciouspolish!